I read about a company that has just started offering a unique service for those who have passed away and wish for their ashes to be spread across the earth. 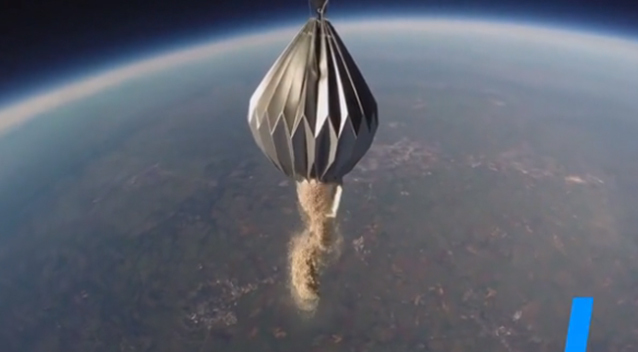 The cremated remains of the deceased are lifted by a balloon into the upper atmosphere. There the ashes are released into the jet stream, where they may float around for weeks. Eventually the remains fall to the earth, sometimes in the form of rain or snow. That sounds like a good way to spread yourself around! However, we don’t have to wait until we are dead to scatter ourselves about. Jesus says that we Christians are the salt of the earth. We don’t stay in the salt shaker! We scatter ourselves around, enriching people’s lives along the way and spreading the gospel message wherever we go. So get out there and spread yourself around! “You are the salt of the earth…let your light shine before others, that they may see your good deeds and glorify your Father in heaven.”—Mathew 5:13-16. This entry was posted in Christian Living and tagged cremation, illustration, Matthew 5:13-16, salt and light, salt of the earth, Sermon on the Mount, spreading the gospel message, spreading your ashes. Bookmark the permalink.